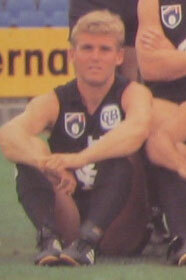 Edgar was drafted from East Fremantle, WA with Carlton’s selection 7 in the 1989 National Draft. A lightly-framed defender with good all-round skills, he had represented his home state against a VFA representative team in 1988, and impressed enough at WAFL level with the Sharks to convince Carlton to pick him up. Edgar played his debut game for the Blues against Sydney at Princes Park in round 1, 1990. Stationed in a back pocket alongside Adrian Bassett and David Kernahan, he was travelling alright at half-time, when his team led by 45 points - but after that, Sydney came roaring back to squeeze out the Blues by 5 points in a tight finish. Edgar was one of those to lose his place after that debacle. He wasn’t able to force his way back into the seniors until round 18, but then played out the season on the last line of defence as Carlton wound up an inconsistent year ranked eighth on the ladder. When the finals got underway, the Blues’ seconds – with Edgar solid in a back pocket - brought some optimism back with a good win over Melbourne in the Reserves Grand Final. Season 1991 brought David Parkin back to Princes Park for his second term as senior coach, replacing the great Alex Jesaulenko. Parkin wasted no time in evaluating the playing list, and one of the first to be put under the microscope was Stephen Edgar. In the first eight matches of the year, Edgar played in five different positions between half-forward and half-back. He kicked his one and only career goal in round 5, against Geelong at Kardinia Park, but it was soon obvious that he was too lightly-framed to hold a regular place in Carlton’s defence, and not quick enough to consistently play as a midfielder or forward. After Carlton’s good win over Richmond at Princes Park in round 9, 1991 – highlighted by Simon Minton-Connell’s six goals at full-forward – Edgar would have a knee reconstruction which basically ended his time at Carlton. So sometime later he returned to WA and to East Fremantle, where he played on a half-back flank when the underdog Sharks beat favourites Claremont in the 1994 WAFL Grand Final. Incidently, he was drafted by St Kilda in the 1992 mid-season draft but he dd not play a senior game with the Saints. Contributors to this page: Bombasheldon , PatsFitztrick , molsey , tmd1 , true_blue24 , Jarusa , steve and admin . Page last modified on Thursday 19 of January, 2012 22:44:16 AEDT by Bombasheldon. 1971 Big V Team - John Nicholls & Geoff Southby.